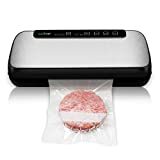 Most food vacuum sealers, whether they are chamber, out-of-chamber or nozzle vacuum sealers, come with a user’s manual to teach the buyer how to use these devices for efficient vacuum sealing of food and other household products. 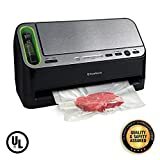 By food vacuum sealer, you can increase its shelf life by five times as compared to ordinary storage practices. If you are not sure how to use your food vacuum sealer, we offer some tips. Choose an appropriately sized sealing bag for the food or other object you want to vacuum seal. Put the product into the bag; make sure to leave at least four inches of space from the margin of the opening of the bag. Place the bag with the open end on the sealing bar inside the vacuum chamber. Shut the lid and press the vacuum sealing start button (or you can opt for the vacuum level adjustment as per your requirement and then hit the start button). Machine will automatically start the sealing process by creating a vacuum inside the chamber. Once the appropriate level of desired vacuum is created, it will automatically heat seals the bag. Air is reintroduced into the vacuum chamber and the lid opens up. You can now remove the vacuum sealed package. Choose an appropriately sized sealing bag for the food or other object you want to vacuum seal (otherwise cut it out from the roll using the built-in cutter) and seal one side. Place the bag with the open end inside the vacuum channel or shut the lid and lock it, depending upon the model you have. Push the vacuum sealing start button (or you can opt for the vacuum level adjustment as per your requirement and then hit the start button). The machine will automatically start the sealing process by sucking air out of the bag; when an appropriate level of desired vacuum is created, it will automatically heat seal the bag. Once the sealing is complete, the machine will stop running or it will indicate completion of the sealing process. Place the product which you want to vacuum seal in an appropriate sized zip bag. Seal the bag with the zip tool. Place the nozzle of the vacuum sealer in the red valve provided on the vacuum bags and pull the trigger to start the process of air removal. It only takes a few seconds for the sealing process to be completed depending upon the size of the bag. If it takes more than the expected time, it may be due to an improper sealing of the bag. In this situation, you will need to reseal the bag using the zip tool and start the vacuuming process over again. When the vacuum sealing device stops making a straining noise and the bag has shrunk tightly around the product to be vacuum sealed, it means that the vacuum sealing process is completed. Now you can remove the vacuum sealed package. We have discussed the basic operation of vacuum sealing by using either a chamber, out-of-chamber or nozzle food vacuum sealer. 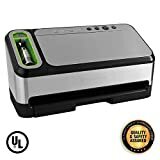 It is advised that you go through the user’s manual thoroughly before operating your vacuum sealer for best results or try watching the instructional videos related to your model on YouTube.